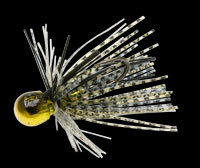 Able to be used as a swimming jig for targeting suspended fish or dredging the bottom with a bottom bumping retrieve, the multicasting rubber jig, MC JIG. Upon first glance it appears as a regular round had ruber jig, but it is designed with the ability to cover a wide range of situations. 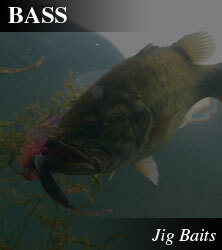 The best possible eye position and hook balance for a stable swimming position and quick response to rod work. 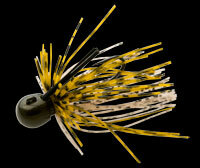 The water running around the jig head causes the carefully adjusted rubber skirt to vibrate. The weed guard has also been positioned after thorough testing. 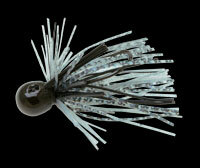 MC JIG is the jig head for a wide variety of situations. 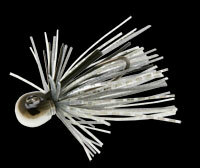 Also included in the line-up is the silicon skirt MC JIG. The silicon skirt is stiffer than the fine rubber skirt, to make each thread stick out further. 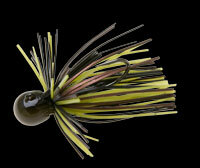 It catches the water to make the lure stand out. 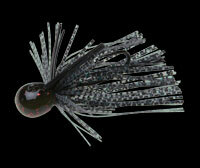 By using it alongside the standard rubber jig skirt, it allows the angler to add a more tactical approach to their fishing style.